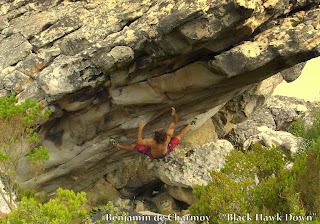 Benjamin de Charmoy has had a strong start to the 2011 season with two fast 8A+ repeats in Topside. He managed to make the 8th ascent of "Ard Ay" after 3 sessions of work. The last repeat of this excellent roof problem was by Emile Esterhuizen back in 2007 so it's good to see it getting more action. Moving to The Cinema, Benj made the third ascent of "Black Hawk Down" which is the 4 move sit start to "Flubber". The line was opened by Marijus Šmigelskis in 2009 and has only seen a repeat by visiting American climber Paul Robinson last year.